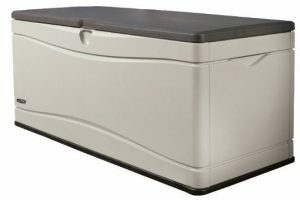 Lifetime’s extra large deck storage box embraces sleek attractive styling braced together by a sturdy reinforced construction comprising a 130 gallon / 500 Litre internal capacity. Triumphant appraisal expressed through feedback boosted Lifetime to receive the Consumers Digest ‘Best Buy award’ for a deck box delivering the most storage capacity with the best warranty related to a horizontal style shed. There’s no disputing the quality on offer here. We became disillusioned with upkeep hassles associated with the wooden designs of outdoor furniture and storage facilities. The time it takes to preserve their structure with re-coats of varnish only to be subject to decay setting in further down the line turned our attention towards a resin composition simply due to their virtually maintenance-free benefits. This Lifetime Deck Box provides the solution for a super-stylish low-height voluminous storage facility that’s aimed to conveniently station in home-yard locations suchlike patios, balconies, BBQ decked areas & poolside whilst protecting storage through an easy-cleaned weatherproof resin manufacture. Lifetime’s modish style comprises an enclosure of weatherproof resin showcasing sleek curvy lines displayed in desert sand and two-toned with a light brown lid & base trim, alternatively can be purchased with a matching desert-sand lid. The low-profile design provides a fab haven for kids toys assisting swift garden tidy-ups, an effective facility to harbour away & enable easy access to pool equipment meanwhile they’ve become a popular solution for those with with a small home-yard to utilise the storage capacity for gardening tools & lawn supplies; usages are quite diverse. Analysing feedback, the realisation of how versatile this deck box is, becomes apparent. Many admire the presentation of modern eye appeal sat on their balcony serving to accommodate outdoor gear like seating cushions & patio accessories meanwhile the sturdy construction doubles up to serve bench-seating, advantageous where space is at a premium. Locating as a smart addition stationed on a patio or BBQ deck, the quantity of feedback describing how purchasers started off with one Lifetime deck box only to shortly add a second and third on account of their flat lid serving as extra table space and their robust construction delivering substantial bench seating, they provide an outside seating area & get-togethers with a helpful accessory. 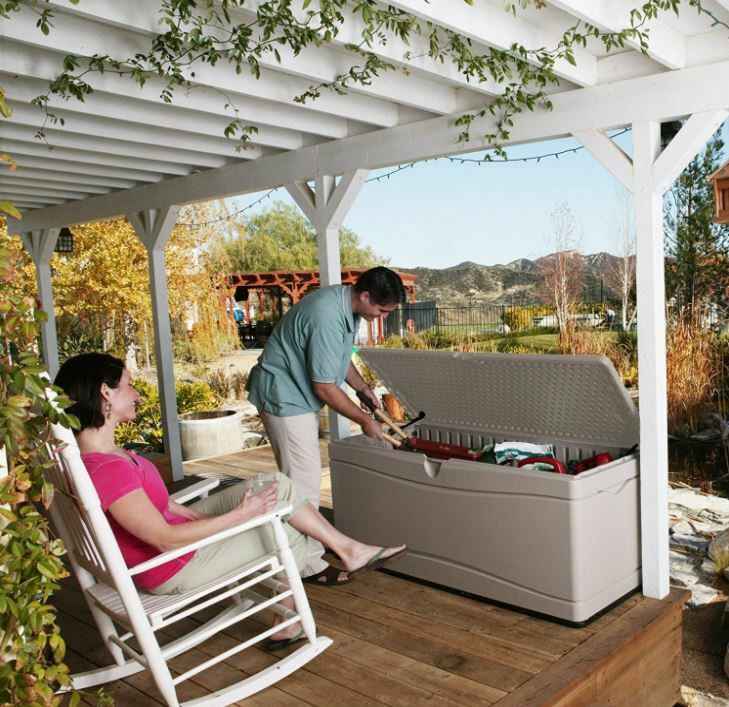 Lifetime deck boxes provide indoor storage solutions too. Accommodating outdoor wear & shoes to a huge blanket box are desired usages, a sturdy unit to harbor toys or sporting equipment out of sight or perhaps a protective hideaway for work tools. Their versatility presents unlimited storage possibilities for endless situations. Lifetime’s deck box manufacture entails a similar process to their walk-in sheds, comprising High Density Polyethylene (HDPE). The resin sheets are molded to showcase a stylistic outer-face exhibiting the shades of desert-sand & light brown meantime a dual skin is formed whereby the inner structure contains deep resin ridges to robustly produce an inflexible composition for rigidity purposes, accomplishing a strengthened overall construction with a weight capacity of 900 lb making this a sturdy seating / storage box. Durability is Lifetime’s incentive and they deliver. Whilst the attractive fascia is designed to enhance any outdoor space, the power lies within the weatherproof polyethylene manufacture. A dual skin puts an end to dents appearing whilst resistant to decomposing through rot & corrosion. Fortunately, it’s completely recyclable therefore at a future date it can be re-manufactured into the latest plastic designs. The best bit: It’s effortless to maintain the pristine condition. A wipe over with a warm wet cloth comprising light detergent brings back the new-look in minutes without being held ransom to those annual re varnishing duties & decaying problems wooden structures are susceptible to. A UV-Stabilisation process takes place within the initial polyethylene mix producing a toughened surface resistant to bleaching & cracking in order to overcome the inherent problem plastic once succumbed to stood outside suffering the scorch of sunburn. I’ve only read one review where the lid suffered warping after being subject to the Florida sun. The overwhelming majority of feedback relating to this deck box stood outside for years in hot climates seems to remain unaffected, hence the Lifetime name. Protection of storage is critical for any facility stood outside enduring the weather elements meanwhile maintaining fresh & dry internals are crucial for storing fragile items like cushions and seating fabrics. Lifetime cushion their lid’s perimeter with a watertight seal to conduce a dry & safe internal environment. The lid-swing is functioned by gas assisted spring hinges to enable effortlessly opening the hefty expanse meanwhile the gas pressure assists in preventing the lid slamming shut on fingers thereby produces a child friendly design if ideas are to accommodate kids toys. Another benefit relates to the way the spring hinges allow the lid to swing back slightly past 90° to attain maintaining an open position, enabling ease of access for organising swift garden tidy-ups and epitomises convenience when storing bulky seating cushions. I have heard of the odd hinge rusting after being subject to damp conditions over the years however upon contacting Lifetime, they have replaced with stainless steel hinges without any fuss. Maybe this is an improvement to their original design. Purposely designed lengthy ridges presented within the internal structure caters for installing your own dividers. The straightforward process of cutting plywood sheets and inserting them into the slots, divides & organises storage into partitions. 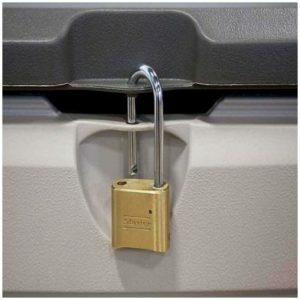 Upon closing the lid a molded padlock loop virtue of two holes in the box-body & lid join together to enable securing the unit, padlock is not supplied. Although Lifetime describe this Deck Box to accommodate 130 gallon storage capacity, this equates to nothing more than figures to most of us. Here’s the external and internal measurements to check the dimensions against location ideas & storage requirements. 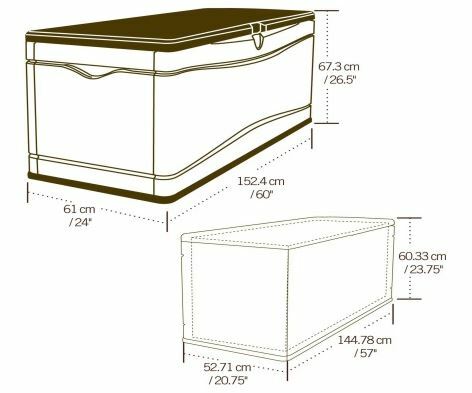 You’re certainly not presented with a complicated endurance task assembling this storage box, construction is very straightforward without involving a mountain of screws to secure. The box-body’s fascia panels interlink with each other simultaneous to interlocking with the base perimeter, followed by securing with 4 screws, one in each corner. The lid requires additional screws for fitting the pistons, hinges and back-plate meanwhile two people assist each other fitting the lid to the box-body. For a sturdy quality box, assembly couldn’t get anymore straightforward, the reason for their popularity and fab feedback. Lifetime’s extra large deck box is probably the biggest selling deck box in America, however, it’s also available in the UK and receives exceptional feedback on both sides of the pond. Displaying an attractive modish desert sand shade, it’s destined to enhance any surroundings whether sat on a balcony, patio, BBQ area or situated poolside meanwhile indoors it’s ideally suited for umpteen storage solutions. Easy access combines with child-friendly features, a watertight seal protects storage by maintaining a dry internal atmosphere, assembly’s a snip meanwhile bench-seating and table-top services serve supplementary advantages. It’s so versatile. 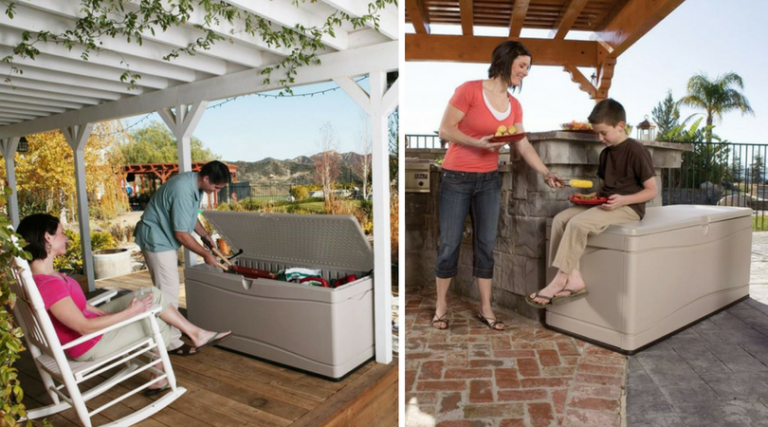 Thanks reading about Lifetime’s extra large deck storage box features. Share you favoured Garden storage box design below along with any related deck box queries. Always a pleasure to help. Please share Lifetime’s extra large deck box. Thank you. 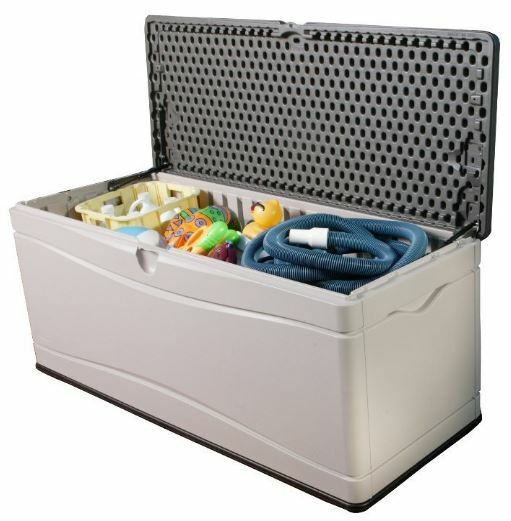 This one looks great for use poolside to keep all of the hoses, auxiliary equipment, cleaning stuff, etc. in. I now just keep everything sitting out in a box which gets soggy from the rain, and then dries out. Not ideal at all. Will this storage box keep most of the moisture out? I know what I have does not, and it would be nice to keep the powdered items from getting soggy and hard. 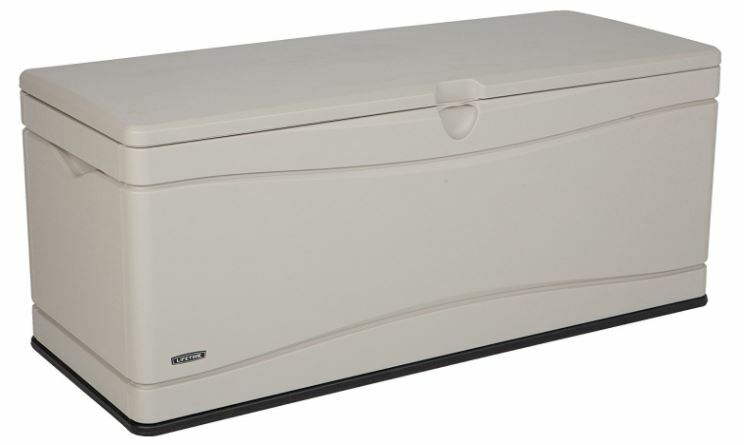 Thanks for visiting to read about Lifetime’s extra large deck storage box. As far as deck box dimensions go, they don’t come more spacious than Lifetime’s largest model. You have quite an abundance of room capable of storing a whole host of accessories plus you can quickly make wood dividers to separate possessions in order to organise more efficiently. 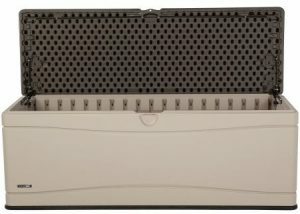 Lifetime deck boxes are designed weatherproof, I haven’t read one review mentioning rainfall seeping inside across their entire range consisting of three sizes, small, medium and large, due to the rubber seal which runs around the perimeter across the box top to where the lid adjoins when shut. These are huge sellers with oceans of reviews to inspect regarding moisture getting inside. They all seem to pass with flying colours throughout the feedback. I love this product! We will be moving to a home that has a small patio, and this would be perfect for storing my gardening supplies, the hose, the bulbs I have to lift every year. We would likely keep it in the garage, because as I said, the patio is small, and I don’t really care for the look in my garden. It’s a great storage solution, however. Thanks for letting the world know about it! 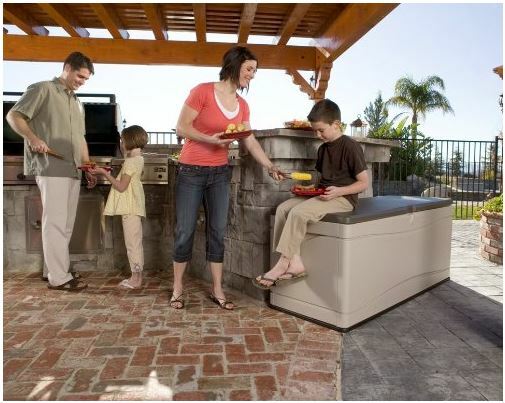 Thanks for reading about this extra large deck storage box manufactured by Lifetime. 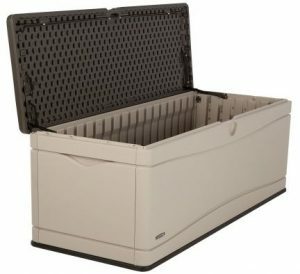 This Lifetime model is very spacious when comparing deck box sizes, ideal to store a whole host of gardening equipment like your hose pipe and bulbs etc. The adequate size makes them a popular storage service situated in a garage like your intentions are. I have friends who store their sporting equipment and work tools this way located in their garage. The beauty regarding this style of storage utility is their low height producing so many alternative locations for placement whilst their large internal space accomplishes an abundance or storage potential, different ideas are being created daily dependant on one’s circumstances. Topping these advantages off is their good looks and easy to clean surface making them a doddle to maintain their attractive appearance. Thanks again Suzi. Good luck choosing your style. Very nice article and a very useful product, I was not aware of this type of product existing until reading your article. I am looking for a storage solution for my garden tools, would this product be useful for this type of storage? I do not have a deck and this would be out in the weather, do i need to protect this product in any way? Thanks for taking a look at these fairly new style deck boxes. These small designed storage boxes do hold a fair amount of storage and are so versatile indoors and out serving to store a whole host of different gear, it’s all down to personal preference to how they will benefit your circumstances. The reason for their sudden popularity is they clear a space in little time and protect what’s inside against the weather elements. Yeah, storing garden tools is a favourable solution especially where space is tight indoors and really does simplify gardening. 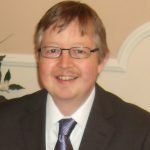 I would measure the internal measurements with your storage to work out whether it will serve your requirements. All deck boxes are not waterproof, in other words they will leak if you fully immersed them in water however they are specifically designed to keep the interior dry against rain and snowfall. I know many people who place theirs in a more sheltered spot during winter and this is what we do, on the other hand I know many people who don’t bother and it still maintains a dry internal space. What we all do however is store more delicate items like cushions and seating covers in the home during winter as the harsh environment may affect them. You could always cover it with those popular tarpaulin sheets you can purchase for outdoor tables and BBQs to be more certain, we do this for one of our outdoor tables, then uncover during spring, summer and autumn.